As a cease-fire ends more than seven weeks of fighting in Gaza, the public expresses more sympathy for Israel than the Palestinians in their ongoing dispute. Most Americans say they sympathize “a lot” (34%) or “some” (32%) with Israel, while roughly a quarter sympathize with Israel “not much” (15%) or “not at all” (12%). There is less public sympathy for the Palestinians: 11% sympathize with Palestinians a lot, though 35% have some sympathy for them. Nearly half say they have little (20%) or no sympathy (27%) for the Palestinians. The new national survey by the Pew Research Center, conducted August 20-24 among 1,501 adults, finds little change in opinions about how President Obama is handling the situation in the Middle East. Currently, 49% say Obama is striking about the right balance in dealing with the situation in the Middle East; relatively few say he is favoring the Palestinians too much (22%) or favoring Israel too much (13%). These views are little changed from April. In addition, the fighting between Israel and Hamas has had only a modest impact on views of prospects for a peaceful two-state solution: 43% say a way can be found for Israel and an independent Palestinian state to coexist peacefully, while 48% don’t think this can happen. In April, 46% thought a peaceful solution could be achieved, while 44% did not. The current survey marks the first time the Pew Research Center has assessed levels of sympathy for Israel and the Palestinians independently. The Pew Research has long tracked a different question which asks respondents which side they sympathize with more in the dispute between Israel and the Palestinians. In this “forced-choice” question (last asked by Pew Research in July), 51% say they sympathize more with Israel while just 14% sympathize more with the Palestinians. That question does not offer explicit options for expressing sympathy for both sides, or neither side. In the July survey, 3% volunteered that they sympathized with both Israel and the Palestinians, while 15% volunteered that they sympathized with neither side. The new survey finds that opinions are more mixed when people are asked separately about their sympathies for Israel and the Palestinians. The wide demographic and partisan differences evident in responses to the forced-choice question are also seen on the new measure, with Republicans, older adults and white evangelical Protestants among the most likely to be highly sympathetic toward Israel, while expressing little sympathy for the Palestinians. By contrast, many Democrats, particularly liberal Democrats, as well as young people and the religiously unaffiliated express at least some sympathy for both sides in the Middle East. Liberal Democrats express similar levels of sympathy for Israel and the Palestinians: 20% of liberal Democrats say they sympathize with Israel a lot, while 45% say they have some sympathy for Israel; 19% of liberal Democrats have a lot of sympathy for the Palestinians and 45% have some sympathy. However, liberal Democrats are more likely to say they have no sympathy at all for the Palestinians (23%) than for Israel (14%). In July, when asked to choose between sympathizing more with Israel or the Palestinians, liberal Democrats backed Israel by a 39%-21% margin. Conservative Republicans are far more likely to sympathize with Israel (63% a lot, 21% some) than with the Palestinians (4% a lot, 22% some). Nearly seven-in-ten (68%) say they have not much or no sympathy at all with the Palestinians, compared with just 12% who say this about Israel. Among those under 30, 62% have a lot or some sympathy with Israel compared with 50% who have the same level of sympathy with the Palestinians. Among those 65 and older, sympathy with Israel surpasses that with the Palestinians by a 72%-40% margin. White evangelical Protestants are deeply sympathetic toward Israel. About eight-in-ten (81%) say they sympathize with Israel, including 59% who say they have a lot of sympathy. Their views of the Palestinians are much cooler: 36% have at least some sympathy with them, while 61% have not much or none at all. Among the religiously unaffiliated, roughly as many say they have at least some sympathy with Israel (61%) as with the Palestinians (57%). The new survey shows that, for many, holding a sympathetic or unsympathetic view of one side does not translate into holding the opposite view of the other side. Overall, 37% say they have either a lot or some sympathy with both Israel and the Palestinians. Another 18% say they have not much or no sympathy at all for both sides. However, a much larger share of the public sympathizes at least some with Israel and not with the Palestinians (29%) than sympathizes with the Palestinians and not with Israel (8%). Among Republicans, roughly half (49%) sympathize with Israel and not with the Palestinians. About a quarter (26%) say they sympathize with both sides; very few say they sympathize only with the Palestinians (2%). Among conservative Republicans, 58% sympathize with Israel while expressing little or no sympathy for the Palestinians. 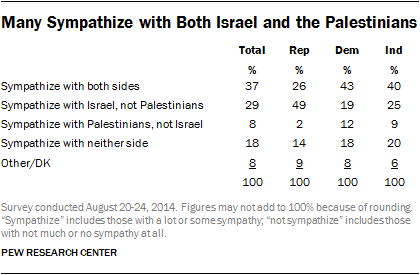 By contrast, a plurality of Democrats (43%) express sympathy for both Israel and the Palestinians. The shares siding only with Israel (19%) or only with the Palestinians (12%) are relatively modest. Half of liberal Democrats (50%) express sympathy for both sides in the Middle East. About half (49%) of the public says Obama is striking about the right balance in dealing with the situation in the Middle East, while 22% say he is favoring the Palestinians too much and 13% think he is favoring Israel too much. Views are little changed since the question was last asked in late April. As in April, there are wide opinion gaps on this question across party lines. A 45%-plurality of Republicans say Obama is favoring the Palestinians too much. Among conservative Republicans, as many as 55% take this view. By contrast, most Democrats (71%) say Obama is striking the right balance in dealing with the situation in the Middle East. Can Israel and Independent Palestinian State Peacefully Coexist? The public remains divided over whether or not a way can be found for Israel and an independent Palestinian state to coexist peacefully: 43% say they think this can happen, while 48% do not think so. 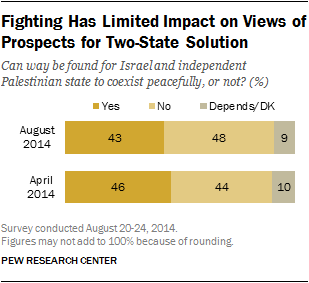 In April, 46% thought a two-state solution in the Middle East could work, while 44% disagreed. Among those under 3o, 53% think an independent Palestinians state can peacefully exist alongside Israel, compared with 42% who do not believe this can happen. Opinion is more negative among those 65 and older: by a 53%-34% margin, more say they don’t think a peaceful two-state solution can be achieved than say it can be. Across partisan groups, 60% of conservative Republicans say they are doubtful about the prospects for a two-state solution, while 36% think this can be achieved. Among liberal Democrats, a slim majority (55%) thinks a way can be found for an independent Palestinian state to peacefully coexist with Israel; 40% do not think this can happen.